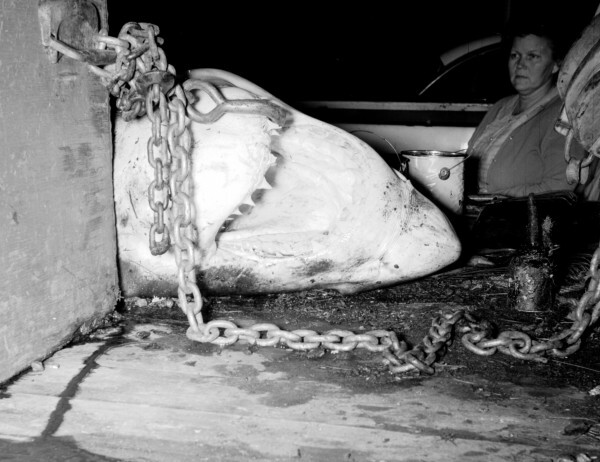 This great white shark killed Basil the Seal, a well-known pet of a Rockport diver, in 1960 off Mark Island in Penobscot Bay. 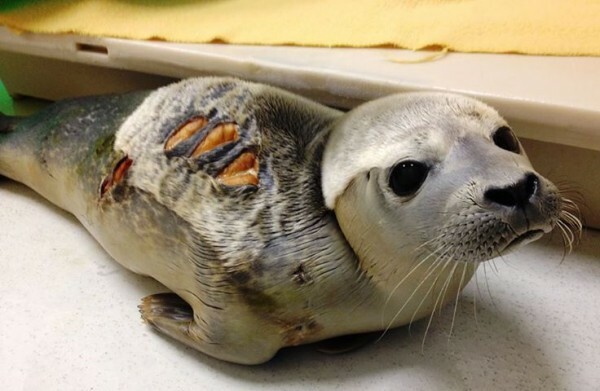 A seal dubbed Charleston Chew is being cared for at the University of New England Marine Mammal Rehabilitation Center after encountering sharks. BOOTHBAY HARBOR, Maine — At least three Boothbay Harbor-area lobstermen watched what they believed to be a great white shark feasting on the carcass of minke whale this week, one of the men confirmed Friday morning. The news of the possible great white sighting represented the second time in two days that sharks stole headlines in Maine, as an unconfirmed shark report off Wells Beach attracted police attention Wednesday and Thursday. Boothbay Harbor lobsterman Ryan Casey said he watched the approximately 15-foot-long shark feeding off Damariscove Island for about 20 minutes Tuesday, while he said two fellow lobstermen had been watching the ferocious dining for as long as two hours. While the species of the shark the men witnessed has not been officially confirmed, Casey took video footage of the carnage with his cellphone, which was posted to the Boothbay Register YouTube page. The lobstermen described the shark as dark on top with a white underbelly, generally matching the description of a great white. Casey acknowledged he’s “not a shark expert,” but said he is familiar with sharks more commonly seen off the coast of Maine, such as blue, mako and porbeagle sharks. The one he and other lobstermen witnessed on Tuesday south of Damariscove was different, he said, and much closer to land than he had typically seen sharks in the past. Great whites shot into pop culture notoriety as the man-eating species depicted in the 1975 Steven Spielberg horror movie “Jaws,” and are listed by the cable network Animal Planet as the natural world’s No. 1 predator, besting lions, grizzly bears and crocodiles. Another cable network, the Discovery Channel, devotes a week of programming to the razor-toothed fish every year. “Shark Week 2013” begins Sunday. Despite the fact that great white sightings off the coast of Maine are extremely rare — a long popular belief in the state held that the waters are too cold this far north for the predators — scientists agree the world’s largest sharks do indeed swim by the Pine Tree State. “The range does go that far north, and there have been some fairly large great whites caught off Canada,” Nancy Kohler, of the National Marine Fisheries Service’s Apex Predator Program, told the Bangor Daily News in 2012. Kohler said great whites can be found in waters as cold as the low 50s. According to the National Oceanographic Data Center, the average ocean water temperatures from Portland to Bar Harbor remain in the upper 50s and lower 60s from June through September. Last July, Massachusetts wildlife officials confirmed the first great white attack on a human in New England since the 1930s in the case of a Colorado tourist who suffered nonfatal leg injuries when bitten while swimming off Cape Cod. On Wednesday evening, a person fishing off a Wells Beach jetty reported seeing a shark there, Wells police Sgt. Kevin Chabot said Thursday. The jetty extends about 300 feet into the ocean, Chabot said, and the sighting occurred at approximately 5:30 p.m. Wednesday. He said that police boats and on-shore monitors were deployed to investigate, but thus far, neither police nor Maine Marine Patrol officials have been able to confirm the sighting. Chabot said on some previous occasions, Wells Beach shark reports turned out to be sightings of sunfish, which are similarly large and have pronounced dorsal fins as well. In August 2002, sightings of at least two sharks — including one approximately 12 feet long — forced the closure of Wells Beach to swimmers on multiple days. Wildlife experts at the time told The Associated Press they believed the sharks to be blue sharks or mako sharks, either of which can be a threat to humans. There was no speculation reported at the time that the sharks were great whites. In the aftermath of the 2002 sightings, tourists reportedly flocked to the beach in hopes of getting a glimpse of the ocean predators. In 1960, a seal that was a well-known pet of a Rockport diver was killed by a great white shark off Mark Island in Penobscot Bay. The diver killed the shark but it was too late for the seal.